Angolan Bible Translators Studying in the Land of the Bible! Twenty Bible Translators and Consultants from Angola are having their first encounter with the Land of the Bible. 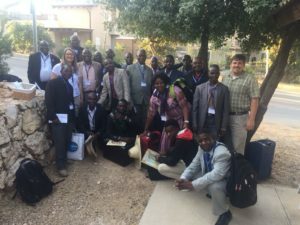 This group, which represents a broad spectrum of different Christian backgrounds and six different Bible Translation teams, is the first group from Angola that is participating in a JCBT course. In learning to put the Text of the Bible in its original Context, they recieve a first hand encounter with the geography of the Land of the Bible with high-quality teaching focused on translation issues. This course is part of their two year training program, held by the United Bible Societies (UBS). While here, they will recieve an official UBS certificate that will signify the completion of their training. The group will leave Israel on July 29th. Want to know more about the Short-Term Course, “Land of the Bible?” Click here and find out more about this program, which will have more than 100 students in 2018.